DePuy ASR Trial Concludes in Los Angeles in Win for Plaintiff, Second DePuy ASR Hip Replacement Lawsuit Now Underway in Illinois. For more information on filing a DePuy ASR hip replacement lawsuit, or to arrange for a free legal consultation, please visit yourlegalhelp.com, or call 1-800-399-0795. Court records indicate that nearly 11,000 DePuy ASR hip replacement recall lawsuits have been filed since the metal-on-metal hip implants were withdrawn from the market in August 2010. Most claims are pending in a multidistrict litigation in U.S. District Court, Northern District of Ohio (MDL 297). A series of bellwether trials are scheduled to begin in that litigation this spring. According to Wright & Schulte, DePuy ASR trials have been eagerly anticipated by plaintiffs and attorneys alike, as the outcomes will help predict how juries might rule in similar lawsuits. Last year, three plaintiffs in a consolidated Nevada case did reach DePuy ASR settlements with Johnson & Johnson for roughly $200,000 each. [Rundle v. DePuy Orthopaedics Inc., A-11-636272, Clark County District Court] Late last year, Bloomberg.com also reported that the company offered to resolve all DePuy ASR hip replacement lawsuits for an average of $200,000 per case, but the DePuy ASR settlement offer was rejected as being too low. The news of the first verdict has led to new speculation that Johnson & Johnson could seek again to negotiate a global DePuy ASR hip settlement. 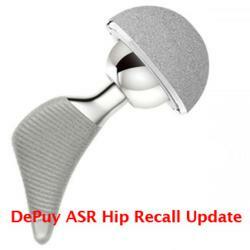 The DePuy ASR hip recall resulted in additional scrutiny on the part of the U.S. Food & Drug Administration (FDA), which launched a safety review of the devices in 2011. The DePuy ASR and other metal-on-metal hips were brought to market without human testing, under the FDA’s 510(k) approval process. In January 2013, the FDA proposed reclassifying metal hips, which would make the devices ineligible for 510(k) approvals. The agency also said that patients fitted with metal-on-metal hips should have metal ion testing and additional screening if they suffered any signs that could indicate their hip might be failing. If you or a loved one were a victim of complications related to the DePuy ASR hip replacement recall, it is important to act now to ensure you receive the compensation you deserve for your pain and suffering. To learn more about filing a DePuy ASR hip implant recall lawsuit, please contact Wright & Schulte LLC today by visiting yourlegalhelp.com, or call 1-1-800-399-0795. Wright & Schulte LLC, a leading personal injury firm, is dedicated to the belief that America’s legal system should work for the people. Every day, the attorneys of Wright Schulte LLC stand up for the rights of people who have been injured or wronged, and fight tirelessly to ensure that even the world’s most powerful corporations take responsibility for their actions. If you’re looking for a law firm that will guarantee the aggressive and personal representation you deserve, please do not hesitate to contact Wright & Schulte LLC today. Free case evaluations are available through yourlegalhelp.com, or call 1-1-800-399-0795.